Craig Vye (born 19 July 1983), is an English actor, best known for his role as Ethan Scott in teen soap opera Hollyoaks. Craig was born in Hertfordshire, England. Vye trained at RADA, graduating in 2005. He was a member of the Big Spirit Youth Theatre starring in various roles such as Rosencrantz in Hamlet, Demetrius in A Midsummer Night’s Dream, Eiliff in Mother Courage, Augustus in The Importance of Being Ernest, Ralph in The Lord of the Flies. Craig and his wife Amber got married in May 2009, Amber is a principal at a theatre arts school. What is it about Sundays, you ever have loads to do or just have a really lazy day. Well whether you are having a mad Sunday like me or a quiet one, here is Jack Donnelly from the BBC series Atlantis, which I shall be catching up with Series 1 today, if I get time. 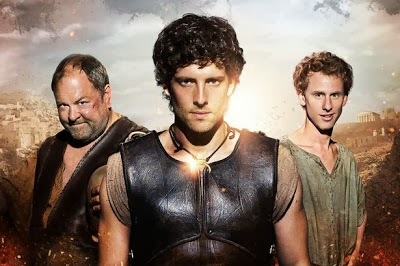 If you haven't seen Atlantis Series 1 you should, even if its just for Jack Donnelly, no actually really it is a good series, based on greek myths and the myths surrounding Jason from greek mythology. Series 2 has been commissioned, and will be shown on BBC 1 in the UK and BBC America in the USA. Jack Donnelly (born 1986) is an English actor, best known for his role in popular Nickelodeon series House of Anubis. In March 2013 it was announced that he had joined the cast of BBC series Atlantis, which commenced in September 2013, in the lead role, Jason. He is a founding member of the improvisational comedy group "Chuckle Duster", which performs occasionally in East London. His mother, Chrissie Wickham, a choreographer (of the Eurovision Bucks Fizz winning dance routine in 1981), actress and former Hot Gossip dance troupe member, performed in Starlight Express whilst up to six months pregnant with Jack, which he mentioned in an interview on the Graham Norton show on BBC Radio 2 on 21 December 2013. He was born in Bournemouth and comes from Ringwood, Hampshire. He attended St Catherine's Primary School in Wimborne, Dorset, and then St Peter's in Bournemouth.